Kristy is a 2003 graduate of Ball State University, with a degree in Telecommunications/Marketing and Sociology and a retired World Champion professional boxer who has been with Rock Steady Boxing since it was founded in 2006. She was approached by Scott Newman, a young on-set Parkinson’s sufferer who discovered that intense boxing training could actually reverse some symptoms, to help build Rock Steady so that others could benefit from boxing style training. Kristy began her boxing career as Indiana Golden Gloves Women’s Champ then went on to become the first ever Women’s Indiana State Champion and NABC Featherweight and Super Featherweight World Champion. In 2009, Kristy won the WBF Light Welterweight World Championship over Eva Young Jones and lost a split decision to Mary McGee for the WBO World Title, which will be remembered as one of the best women’s professional boxing match ups in the sport’s history. 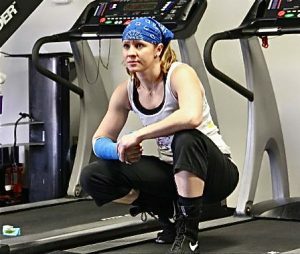 With several nationally televised bouts to her credit, Kristy retired from competition in 2010 with a 16-2 record (9KO) to focus on her professional career of helping people with Parkinson’s fight back and motherhood. Kristy understands through her experience the benefits that boxing style training can bring to people with Parkinson’s in addition to Parkinson’s specific exercise. She is a Certified Personal Trainer through the American College of Sports Medicine and a Corrective Exercise Specialist through the National Academy of Sports Medicine. Kristy uses her experience of professional boxing and education in physical conditioning to design curriculums specific to varying levels of Parkinson’s disease.